Oh em gee. Everyone, this is the greatest thing since sliced bread and you need it. Honey is a new Google Chrome extension that automatically applies coupon codes for you when you shop online, saving you tons of money! It is completely free to install and it couldn’t be safer or easier to use. Honey does all the work and scours the web for ANY coupon codes that are valid for the website where you’re shopping. When you get to checkout, a box will pop up and tell you how many codes are available and valid. You can choose which one to use, or you can just click the Honey button in your browser and they’ll apply the highest value coupon codes automatically. You save without having to do anything. So awesome. Getting Honey is a snap. 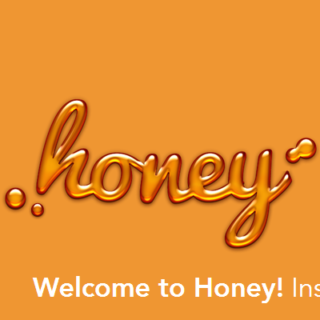 All you do is go here and click on the orange ‘Add Honey to Chrome Button’. If you don’t have an account yet, complete the simple sign up and that’s it, you’re done! If any of you haven’t upgraded to Chrome yet, do yourself a favor and do it now! Chrome is the most stable browser out there. It is blazing fast and after upgrading, you’ll cringe if you ever have to use something else. Firefox gets bogged up so easy and shuts down without notice. Safari makes everything look different – I can’t stand it. And I don’t even know if Internet Explorer deserves to be mentioned. Two words: just don’t. It is awful and buggy and super outdated. I hope none of you are still using it. Use Chrome and the Honey Google Chrome Extension and save every time you make an online purchase. You’ll be surprised how much you save! Wow this looks awesome I’d love to try it! This app is awesome! It makes finding coupon codes online so much easier! Wow, this is an amazing app. Who doesn’t love to save money. Thanks for sharing! I would absolutely love this! I spend so much time on the internet either trying to find good deals or discount codes for shopping. Your app sounds like this would be a big help. This looks amazing! I am going to have to try this! I always spend so long looking through coupon sites and googling deals… Seems like this option may be the way to go! thanks .. I would like to try this app. This is a great extension and I installed it a few days ago. I haven’t used it yet, but a couple of times it automatically brought up coupons for several sites when I was just looking around at some things at online stores. The next time we order something, I hope it has some great deals. I’ve had this extension multiple times. After wiping my computer, I’d reinstall it. Since I saw this post, I’ve found this extension to be really useful. No more searching for codes!